The infamous children's tale of the woman who lived in a shoe is finally making sense. A story that played on such ridiculous logistics did not fare well with my former child-self: hoarding so many kiddies within one tattered sole? How sadistic. Nowadays, its clear this was the first nursery rhyme written by a shoe addict. The fetish is one that rides within the underbelly of woman-kind; and fashionista or nay, most women will at least acknowledge a good set of soles. With seasonal emphasis on clogs, p l a t f o r m s, wedges, and integrations of all three, I think its safe to say diamonds are dead. My own dietary preferences have undergone a notable shift from boots to bootie-wedge. Always driven by comfort and never inspired by height, it must be said that the thick shoe trend has caught my eye and stolen my favor. Like other gals, I've had a tough time finding compatibility with the heeled sort, and stilettos + pumps are the equation of anti-climax. 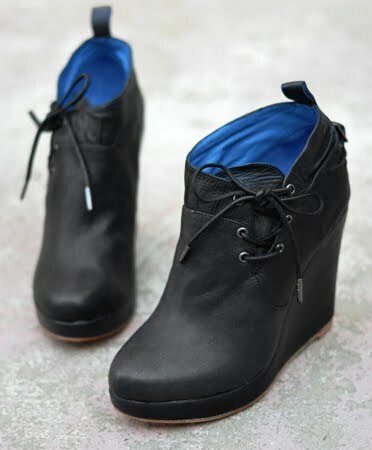 The bootie-wedge fusion, however, is a whole other story. With an early summer purchase of the Illex Kinni Dancers (See featured: #4) these stacks allowed me a brand new lease of height, in where I now understand the height-high. Elongated legs, instant vamp, and the single-handedly most efficient way to make an outfit–– I am sold on this new perspective. And hey, if we can't be a few steps ahead, we may as well be a few steps above. Pony up. 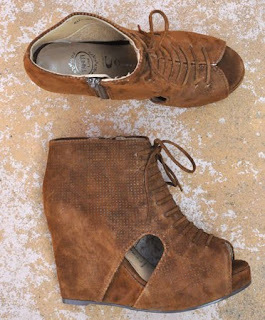 I love those Jeffrey Campbell wedges! Amazing blog too, you are such a good writer!